The Wizard World Philadelphia was the place to be this weekend. 6'11" Chewbacca actor Joonas Suotamo was there to promote the upcoming Solo: A Star Wars Story and he ended up running into some heroes of his including Hobbits Elijah Wood, Sean Astin, and Billy Boyd, who had a mini Lord of the Rings reunion. Suotamo took over the Chewbacca role from Peter Mayhew, who is 7'3", in 2015's The Force Awakens. Mayhew's knees started to go out, so Suotamo ended up getting the new role. Joonas Suotamo was very excited to meet Elijah Wood, Sean Astin, and Billy Boyd and wanted to get a picture to remember the event forever. The Solo actor took to Twitter to share the hilarious picture which has his head cropped out of it to make it look like the actors who played the Hobbits in The Lord of the Rings were really that short. Everybody, except for Suotamo, has huge smiles on their faces. Joonas Suotamo probably did as well, but as previously mentioned, you can't see his face. Suotamo captioned the photo saying, "Finally met my heroes - The Hobbits from Lord of The Rings!" After Joonas Suotamo posted the picture on social media, Elijah Wood commented by saying, "Chewie can see Endor from up there," to which Suotamo revealed that he can see over Mount Doom and into Hobbiton. The Finnish actor is a former basketball player and he's clearly enjoying his new gig as the coolest Wookiee in the galaxy. Billy Boyd even got into the fun, commenting that Chewbacca's armpits smell really nice, which is good to know because a lot of Star Wars fans needed to know that. For Star Wars and Lord of the Rings fans, the picture is pretty awesome. It's especially cool to see the Hobbit actors getting together and hanging out, making fans happy like Joonas Suotamo. Hopefully they all went out for a bite to eat and some partying afterwards. Some photos of Chewbacca raging with Hobbits is the only thing that would be cooler than photographic evidence that we have. 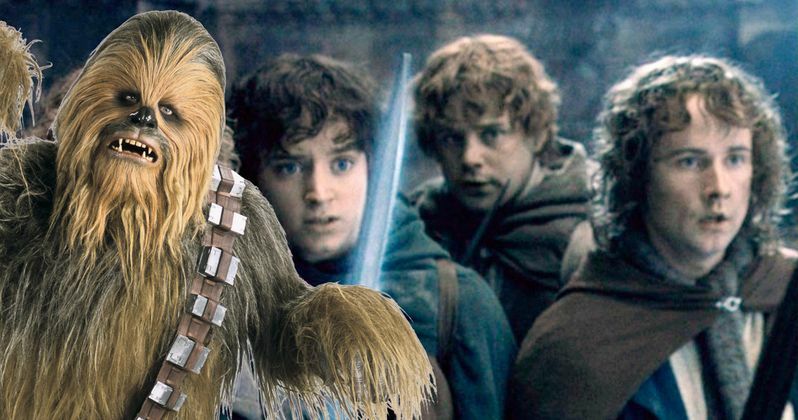 Chewie is used to hanging out with Ewoks, so hanging with Hobbits is really no big deal, there's just less hair involved. Solo: A Star Wars Story hits theaters this week and the film has been getting good early reviews since it premiered more than a week ago. There have been the usual Star Wars fan gripes, but for the most part, everything seems to be going pretty well for the young Han Solo spin-off. Musician Ryan Adams says that Solo is his favorite Star Wars movie ever while director Kevin Smith says that it made him really happy. Maybe a Star Wars and Lord of the Rings crossover is in the works... You can check out the awesome picture of Chewbacca hanging with the Hobbits below, from Joonas Suotamo's Twitter account.